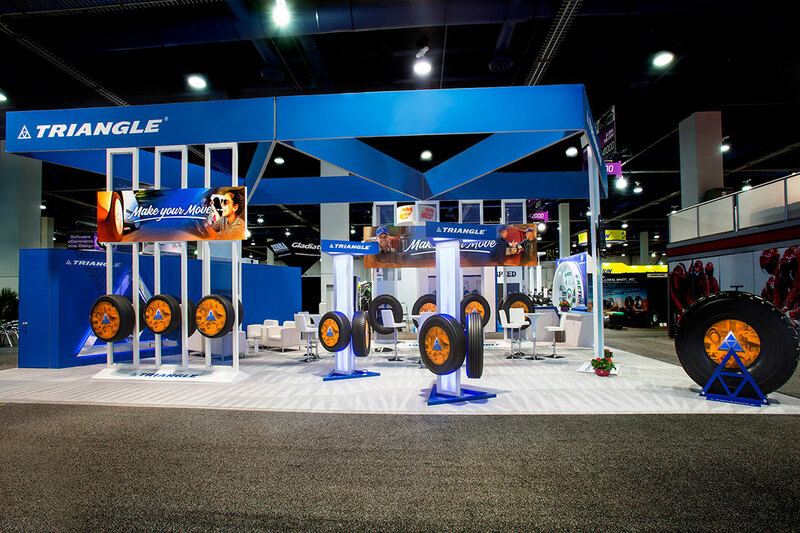 Triangle Tire USA wanted to build its first-ever domestic booth for the Specialty Equipment Market Association (SEMA) in Las Vegas to launch their North America presence. 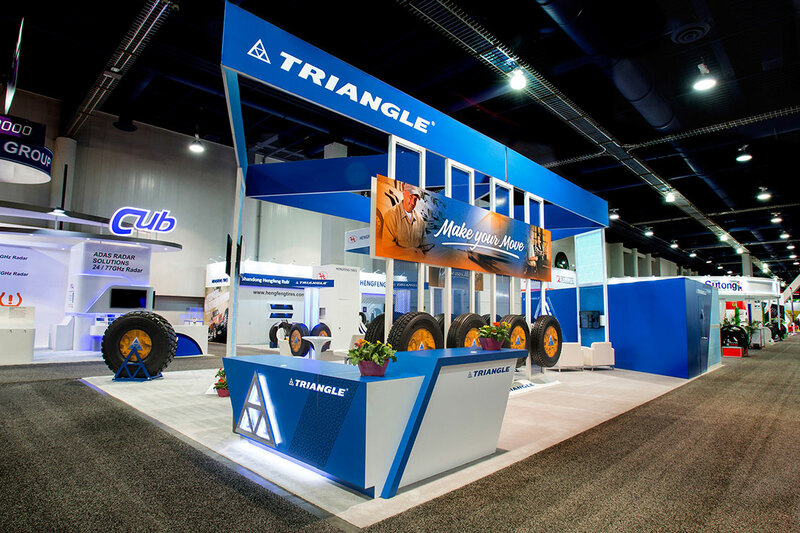 The directive was to create a booth with an open and inviting layout that had the look and feel of an American brand and prominently featured the Triangle Tire USA logo. CEI was asked to create a 20’ x 50’ island booth that could break down into a 20’ x 40’ layout. The client requested one private meeting room inside the booth, plus a reception desk to collect visitor information and do a daily lucky draw. With our multi-decade history in the automotive business, CEI was uniquely prepared to create tire displays and branding presence to put Triangle Tire USA and its products in the best light. Our Design team offered multiple booth design layouts and additional tire stand options for them to review. 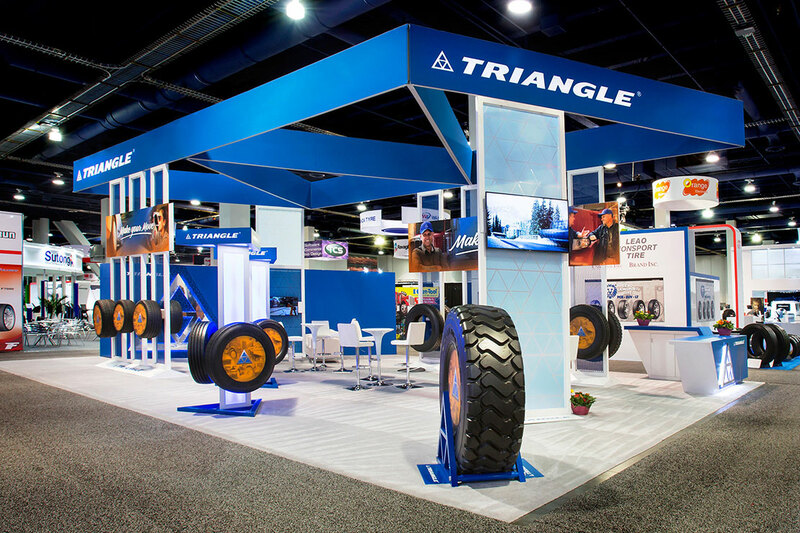 The focus of the booth was to make Triangle’s tires and brand the “heroes.” We created tire stands with a contemporary, clean design and offered multiple opportunities for branding throughout the booth. Incorporating aluminum with the brand’s white and blue color scheme gave a sense of openness. Using their logo as a repetitive design element on the reception counter and conference room walls exceeded the client’s expectation of incorporating the brand into the design. The highly-branded booth provided an open concept design and modular capability for smaller shows in the future. The use of graphics was minimal; only lifestyle images without copy and the Triangle logo were used to create visual impact. All furniture and accessories echoed the white and aluminum booth design. 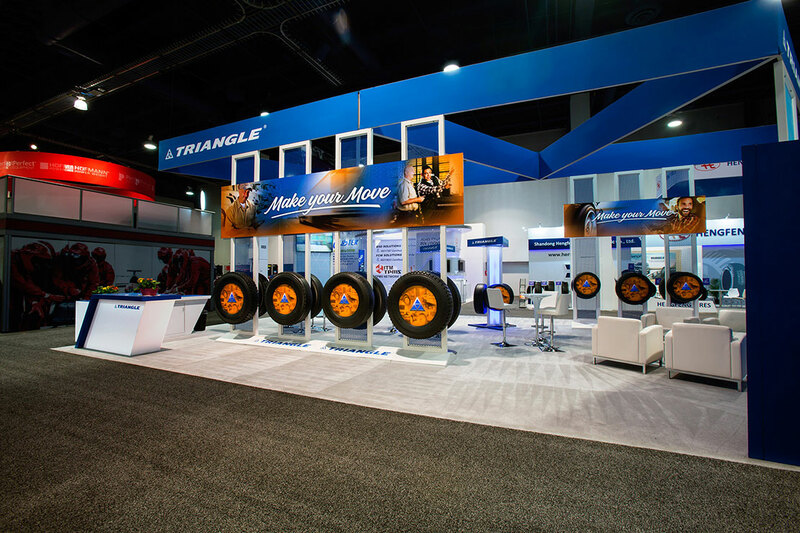 At the inaugural use of the booth at SEMA in 2016, Triangle Tire USA had the highest traffic of any domestic show to date, and the tires and brand received the domestic targeted traffic it was seeking. The in-booth meeting space was busy for nearly 100% of the show hours, and the reception desk staff was bustling from open to close addressing prospective customers’ questions.